Technical Car Experts Answers everything you need: How to test coil and spark plugs on ford taurus? Turn the ignition OFF . Disconnect the wiring harness from the ignition coil. Check for dirt, corrosion or damage on the terminals and repair as necessary. Measure coil primary resistance between ignition coil pin 4 (B+) and pins 1 (coil 2), 2 (coil 3) and 3 (coil 1). Resistance should be 0.3-1.0 ohms. If resistance is out of specifications, replace the coil pack. If resistance is within specifications, proceed to secondary windings testing. Measure coil secondary resistance between the corresponding spark plug wire towers on the coil. Resistance should be 12.8-13.1 kilohms. If secondary resistance is not within specification, replace the coil pack. Unplug the engine control sensor wiring connectors from the ignition coil and the radio ignition interference capacitor. Tag and disconnect the spark plug wires from the coil by squeezing the locking tabs, then twist the tab and pull upwards. Unfasten the four ignition coil retainers and remove the coil and the coil ground wire the radio ignition interference capacitor. Save the capacitor and coil ground wire for re-installation of the coil assembly. Wipe the coil towers with a clean cloth dampened with soap and water. Remove any soap film and dry with compressed air. Inspect the coil for cracks, carbon tracking, dirt or damage and replace as necessary. 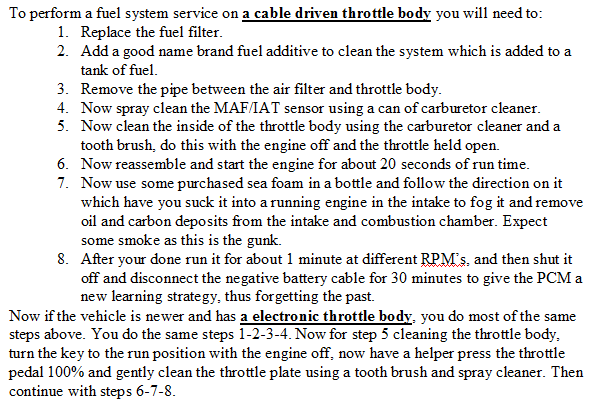 then do a fuel system service shown below. Re check spark plug wires connection.If they are getting loose or fouled. Labels: How to test coil and spark plugs on ford taurus.